Panel eight was rendered in May; the rest a couple of weeks ago. 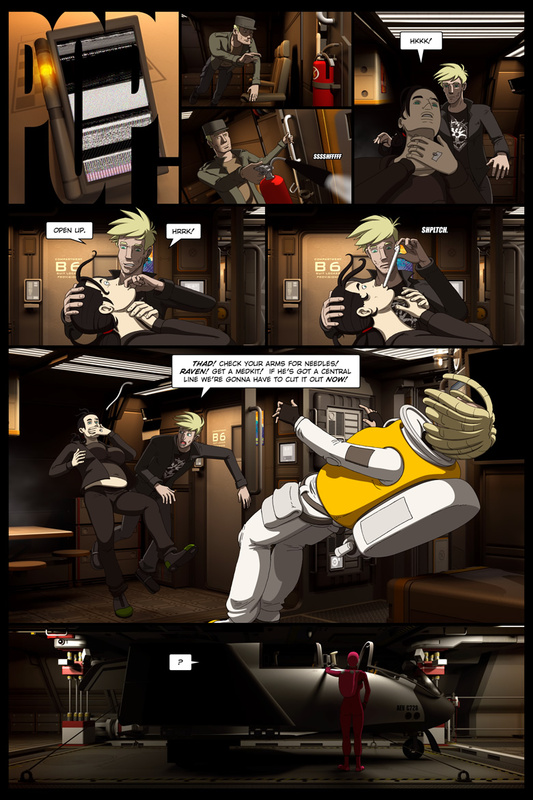 The conspicuously placed fire extinguisher finally gets used; the HRD goes bang like the Chekov’s Gun that it is (was), and the best thing about panel four is that it makes the rest of the page look great by comparison. I caught a rendering error shortly before posting – an error that’s already been fixed on subsequent pages. A section of central corridor wall was missing from panels five and six. It had been turned off to accommodate the camera a few pages back and I didn’t notice that I’d left the walls off until I started rendering work on air -39-. Oops! Panel seven needed some patch rendering as well, and fixing panels five and six gave me cause to check over the rest of the scene, so air -39- got fixed some more. That should do it. It’s been mentioned previously that HRDs aren’t particularly tolerant of sudden high-level energy spikes. This is the first time a blowout has been depicted on screen – it’s loud, but not particularly dangerous, at least in this instance. Readings are off the scale. It’s taken awhile to sweep it under the rug but the HRD is finally getting an appropriate exit. While the technology will continue to exist in the story, further obsessing over readings does nothing to advance the plot. Out it goes! Instead of Raven rattling off readings we’ll be getting a visual example of smoke and ventilation in microgravity. The five pages after this one are done – production of this scene finished on October 2nd and the pages will be posted through November 9th. Hopefully the remaining three pages of the chapter will be finished before that. I began developing the CG asset required for the next scene in March of 2009 and resumed work on it during the October 2nd work session. The asset is very well developed at this point and will hopefully be completed this week. Most of the hard work was done five years ago as a breather from production of the second edition of The Dualist, which makes the asset a bit like the Banshee in that the heavy creative lifting was done Back In The Day. This time I’m doing the rest of the work sober, and that’s making a big difference. Thad is (or was) intubated, which helps explain panels six and seven. The Dualist ought to explain the rest of it. If it doesn’t, no worries – the scene will provide a verbal explanation in short order. The fact that the hardware in question bears no resemblance to actual intubation equipment is handwaved as follows: (a) Space human medical technology is not earth human medical technology; medical hardware is a textbook example of convergent evolution, and (b) despite the Sabrosa benefiting from artificial gravity the vast majority of medical equipment on spaceships is designed to work without gravity or with variable gravity. Space medical equipment needs to resist sudden changes to gravity or atmospheric pressure; something earth medical equipment isn’t typically subject to. As such, various bits that would otherwise just be inserted and left hanging are typically secured, and are designed with this requirement in mind. If you want an explanation for Heirotus medical procedures in media res, you’ll have to wait for the next chapter. Assuming it doesn’t get cut, that is. Fire should be a lot more developed than it is at this point, honestly – it’s still an outline and a handful of scene roughs with some approximate page counts and I’ve been more concerned with the asset requirements than the actual story during my last few planning sessions. At present I only work on the chapter when I’m doing laundry, and due to a number of factors that’s been once every three to five weeks for months now. After I finish the assets for this chapter I’ll do something about that – in the meantime, getting this chapter completed is a higher priority than getting the next one started. Next week – We’ll hear from the Castores… and they ain’t happy! 114 queries in 0.861 seconds.